I appreciate the response given by fellow bloggers and their 15 favorite horror films. Below you'll find a link to each site, and I'll update it daily. 1. Night of the Living Dead (1968), dir. George Romero- This was one of the first horror movies I remember watching, and more directly, watching through the slits of my fingers as I held them over my eyes. Even today, Romero’s black and white zombie-fest is light years ahead of the social commentary and the gory bleakness of modern horror films. “Night of the Living Dead” is a perfect example of a filmmaker creating the right movie at the right time with an ample understanding of its context in history. 2. Demons (1985), dir. Lamberto Bava- Carrying on the horror tradition of his father, Mario, this Italian zombie movie (like Romero’s above) constantly exerts a sly gesture of political and cinematic winks, while remaining wholly true to its gore-induced roots. A group of people are trapped inside a movie theater while flesh eating zombies claw away at them. While fellow Italian filmmakers were creating horror films whose splintered narratives made them feel choppy (see any Lucio Fulci film) Bava’s intention was clear- entertain. And in the process, he infused new life into a deflated genre. Extremely bloody and sometimes shocking. 3. The Texas Chainsaw Massacre (1974) dir. Tobe Hooper- Besides the obvious reasons, Hooper’s masterpiece feels unlike any other horror movie- raw, unfiltered, dirty… all of the things that give this movie a “lived in” feel. Hooper never quite regained his chops after this debut, but the existing result is a terrifying and perverse portrait of madness that fits perfectly into any midnight movie extravaganza. This is the kind of film that forces you to take a shower after watching it. 4. Ju-On (2004) Takashi Shimizu- Only 2 years ago and the J-Horror movement was beginning to take shape. Now, Hollywood has drained the life out of the genre, substituting teen cleavage for harsh psychological thrills and abrasive editing in place of subtle, jarring movements in the corner of the frame. And while it’s hard not to partially blame Shimizu for this (seeing as how he re-directed 2 of his Asian films for Hollywood with Sarah Michelle Gellar), this 2004 J-Horror film really pushed these films into the limelight. Tremendously creepy and eerie, Ju-On works best in a dark movie theater with the sound cranked up and no where to hide from the images. While the film’s story- ghosts in a big bad haunted house- lacks some spark, the energy of the film lies in the small scares and the suffocating mood that slowly boils as the film rolls along. 5. Dawn of The Dead (1979) dir. George Romero- Mass consumerism- both human and un-human- is the real shocker here. While Romero’s sequel is certainly just as socially pointed as the first, Dawn of the Dead spares no limb as a group of survivors fight to stay alive inside a shopping mall. This is fun from start to finish, with more humor and interesting observations than 10 horror films combined. 6. Don’t Look Now (1973) dir. Nicholas Roeg- While there are very few outright scares in Roeg’s 1973 psychological thriller, there is that final scene when Donald Sutherland suddenly finds the thing he’s been chasing for the previous 2 hours… and it’s a downright disturbing moment, and some of cinema’s most devastating final images. Before that though, Roeg amps up the psychological tension to an unbearable level, utilizing sound and mirror reflections to chilling lengths. This is one of the true gems of the 1970’s. 7. The Evil Dead 1 and 2 (1983 and ’87) dir. Sam Raimi- So I cheated here a bit and lumped together two films at once, but can you blame me? Both of Raimi’s hyper-energized flicks cull two distinct generations of horror into two wonderfully realized projects. By morphing the zombies of Romero into the low-budget antics of the independent film movement of the early 80’s, Raimi essentially re-defined the genre in moving and incredibly inventive ways. The reaction shots of Bruce Campbell throughout these films is reason enough to find them, but it also satisfies the gore hound in anyone. 8. House of 1,000 Corpses (2003) dir. Rob Zombie- One of the most disturbing horror (and grindhouse) films of the last 10 years, Rob Zombie’s descent into madness recalls all the B-movie excesses he soaked up as a youngster, but nothing could prepare you for the assaulting final 30 minutes of this film, where sanity and good taste go flying out the window. A group of teens are stuck (where else) in the country when they come across a truly sadistic family who make them their own play toys. Like “The Texas Chainsaw Massacre”, director Zombie has opted for seedy, dirty settings that graphically underscore the malignance of the film’s attitude. 9. Pulse (2004) dir. Kiyoshi Kurosawa- If there’s a common theme among a majority of the films on this list, its mood. Kurosawa has mood in spades. While very few of his films are categorically horror, his films often express a deep rooted sense of dread, and none so brilliantly as “Pulse”. What would happen if spirits from another world use the internet to transfer their presence into our world and slowly bring about the demise of our society? “Pulse” never easily identifies itself, but images of dark rooms as a contorted shadow looms towards us or the solemn quiet that builds throughout certain scenes are highly unnerving. This is one that crawls under your skin, collects in your head and rattles around for days. 10. The Thing (1982) dir. John Carpenter- I rented and watched Carpenter’s version on a whim one day. What I found was an utterly disgusting and disturbing series of images and transformations that changed my perception about Carpenter’s directing skills. There are so many surprises and gross-outs in this film, that it doesn’t seem fair to other horror films. Plus, like “Invasion of the Body Snatchers” and Cronenberg’s earlier efforts, Carpenter was able to scare and create a snide comment on things sexual and political. 11. The Haunting (1963) dir. Robert Wise- Atmospheric and undeniably eerie, Wise accepted this project as a worker under contract and turned it into an instant classic by maintaining smart camera angles and accentuating the presence of the gothic house in which the film’s main characters reside. The final moments, and a face in the attic, are impressive. 12. In the Mouth of Madness (1995) dir. John Carpenter- I know at least a couple of Carpenter flicks has to make the list, I just imagine it’s not the one that will make plenty of them. While I have respect for “Halloween”, I saw it too late in life to recognize its greatness beyond being one of the slasher trendsetters for later generations, and “In the Mouth of Madness” rocked me to the core upon first viewing. Sam Neill plays a novelist whose novel begins to turn people insane as well as calling to life the novel’s nightmarish narrative. While the film’s denouement turns a little tepid, there are some imaginative and jarring moments- a boy riding a bike over and over at night time namely- that gives you a few goosebumps. 13. The Shining (1980) dir. Stanley Kubrick- Ahh those lovely low angle tracking shots. Kubrick, like Polanski, was a director who understood the ramifications of camera placement. That and those weird, eerie red headed twin girls. It’s almost a cliché to list “The Shining”, but it’s a film of immense intellect and wonderful pacing that elicits some twisted moments. 14. Nosferatu (1922) dir. FW Murnau- Black and white is just creepier. While Herzog was able to capture some of the unnerving intricacies of “Nosferatu” in color, the poetry and engraved images of Max Schreck crawling around the screen as the original vampire can never be duplicated. Sensual and scary, Murnau had to speak in purely visual ways, and he created a masterpiece that has stood since the early 20’s. 15. Shivers (1974) dir. David Cronenberg- A bunch of parasitic mutations invade the bodies of people in an apartment complex and turn them into horny zombies. Sounds like the stuff of genuine B horror movie, but Cronenberg’s debut is much more than that… and probably the most overt attack on sexually transmitted disease ever placed on film. While a majority of Cronenberg’s films use genre to comment on other things, “Shivers” speaks volumes while maintaining a tongue in cheek attitude. And joining in on the fun is Weepingsam over at his blog. He conducts a list of oldies but goodies and even manages to throw some theory into the mix. Adam over at DVD Panache also throws up a list and his number 1 will probably surprise you. Evan Waters at Club Parnassus scares up a top 15 at his site as well. Dennis at Sergio and the Infield Fly Rule gives us a link to a list he created last year with the promise of a new one any day now! In the meantime, his blog has been on a Halloween roll anyway, documenting some lost classics and giving us some great old posters to feast our eyes on. And last but not least for now, Moviezzz at his busy blog has also added a list. Updated 10-31! Dennis at Sergio Leone and the Infield Fly Rule has included a new list, detailing his 13 underrated and lost horror classics. He then goes further and lists 13 more, then tops off the whole affair with a "guest writer's" favorite 13. Great stuff. 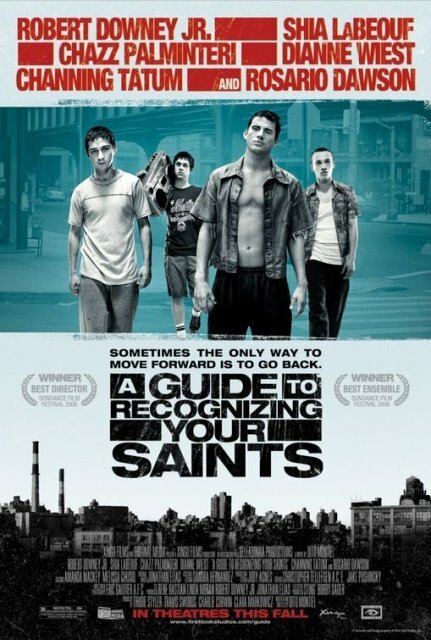 First time director Dito Montiel’s “A Guide To Recognizing Your Saints” is a harsh autobiographical look back at his youth on the mean streets of Astoria, Queens in the mid 1980’s. From the film’s opening moments, Montiel introduces us to an intimate world of family and friendship that totally blindsided me by its greatness. Opening in 2005, Dito (played in adulthood by Robert Downey Jr in yet another devastatingly perfect incarnation) lives as a writer in Los Angeles who’s just written the film’s title. He receives a phone call from his mother (Dianne Wiest) letting him know that his father, Monty, (Chazz Palminteri) is sick and won’t go to the hospital. This, of course, opens up a floodgate of memories for Dito as he flashes back to his younger, wilder days and hops a plane for home. We quickly meet his close group of childhood friends, Antonio (Channing Tatum) is the volatile Robert DeNiro of the group- and while this comparison seems naïve, Turner embodies a hulking character whose violence and strong headed machismo resonates deeply throughout the film- Nerf (Scott Campbell), Joey (Kyle Benitz) and Mike (Martin Compston) a transplanted Scottish boy who plants the seeds of journey into young Dito (Shia Lebouf). And where would a story like this be without first love, tenderly rendered by Diane(Melonie Diaz) the pretty girl whom Dito sneaks up the fire escape for nightly. The conflict comes from familiar sources too, such as the clash of cultures within the neighborhood that pits these five against a Puerto Rican group whose graffitti vandalism encroaches on their turf. But handled more subtly is the dynamics between Monty and Dito- we often get the sense that Dito and his father are more friends than father and son and Monty seems over-affectionate to Antonio, who himself suffers from an abusive relationship with his own father. 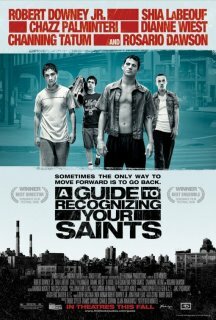 There are moments in “A Guide To Recognizing Your Saints” that roll along with such force and emotion, that Montiel feels like a natural born filmmaker, infusing his personal heartache into strong characters breathing within a vivid time and place. Montiel’s handling of edits, sound, and music are also powerful, such as a scene in Dito’s kitchen between his father and group of friends that explodes into stark images and quick cuts to black. Montiel also handles the return home of Downey Jr. with care and vulnerability, searching for small answers that come in revelatory conversations with his mother and grown up Dianne (played by Rosario Dawson). And while such personal material can be hard to translate without lapsing into melancholy, Montiel finds a way to craft a clear eyed version of his life, allowing strong acting and electric filmmaking to take over the balance of the experience. I love finding unheralded gems such as this. The name of Robert Downey Jr. brought me to the theater and I discovered a true talent in Dito Montiel who has crafted one of the finest directing debuts in several years. With five films under his belt, its been amazing to see director Christopher Nolan grow as a filmmaker (although to be honest, with a film like "Memento" as your second film, I suspect there was very little growth, simply the need for discovery for a talent already in progress). "The Prestige" takes its cue from the fractured narrative of "Memento", pitting two magicians (Hugh Jackman and the consummate Christian Bale) against each other in narcissistic and ultimately violent methods of one-up-manship. Even though we've already experienced one feature this year charting the contrivances of 19th century magicians in Neil Burger's "The Illusionist", Nolan's film is a bit more cynical and looks a helluva lot better. And then you have David Bowie embodying Nikolas Tesla... who could ask for more? "The Prestige" is thoroughly enthralling and continually forces you to pay attention as it skips back and forth in time and place. Sophia Coppola's "Marie Antoinette" is a nice companion piece to "Lost In Translation"- both films deal with anachronisms, a person impeding on a culture with observer-like status, often caught with a what-the-hell-am-I-doing-here stare. And like "Lost in Translation", Coppola feels right at home in documenting the listlessness of her main characters, freeing the narrative from strict plots and subplots, employing her camera to leisurely capture stunning images of life in a constant motion even when there's no purpose. I didn't want a history lesson, and "Marie Antoinette" certainly isn't that. Kirsten Dunst flits through the film in airy, charming ways. Her Marie is a kid in a candy factory, thrust into royal stature without any sense the implications her spending and nonchalant days in the country will eventually have on her people. And, gladly, those days of violent overthrown= are rendered in just 5 minutes of screentime at the end of the film. We've seen too many historical lessons, and Coppola's film, instead, chooses to create a punk rock version of the French queen, full of gorgeous sets and humble humor (and some startling images timed to 80's hits). OK, so this is my feeble attempt at kickstarting a blog-a-thon of sorts. I'm inviting all fellow bloggers to post a list of their 15 favorite horror films on their respective blogs. Now I say "favorite" but one can interpret to mean "scariest", "most disturbing", "the films that scarred me for life".. whatever floats your boat. On October 30th, I'll publish mine here and include links of the blogs that decide to participate. You can either e-mail your link to Henryhill51@aol.com or reply here in the comments section by October 29th. I’m terrible at writing about a filmmaker that I adore quite like Martin Scorsese. It’s so easy to get wrapped up in the hyperbole. And I’m afraid I can’t avoid that pitfall here. His latest, “The Departed” is an electric experience, scurrying back to the violent streets that once made him famous. This is Scorsese at his most playful. Like “Bringing Out the Dead”, “The Departed” throws caution to the wind and belts out a wildy energetic pace that’s matched in strong, calculated performances from all involved. That’s all I can muster to write about this one so far. I watched it twice over the weekend and can’t wait to experience it again. If only every year I could have a Malick film and a Scorsese film top out my favorites of the year. I’ll lay my intentions bare- I love exploitation and grindhouse flicks. I think one has to take into consideration two aspects when one watches these types of films: 1) they’re usually a product of their environment. What I mean by this is that you cannot expect more than a limited budget, horrendous dubbing, poor acting and a diabolical (if not cheap) sense of humor. These types of films were often produced with little funding, limited equipment and actors on loan or leave from more mainstream projects. In fact, this crudeness derived from minimal means often lends an air of perverse sleaze to the entire project. 2) They hardly ever take themselves seriously. The best future for a grindhouse film was to find an interactive audience in a New York slum theater and play for 2-3 months to the lowest common denominator of the movie-going public. That was the measure of success with this genre. With that in mind, the overwhelming goal of the grindhouse film was not to make explicit any political or social messages (although that was a joyous byproduct of some of the best) but to simply entertain. The reason that Troma films are more entertaining than say, films such as “See No Evil” or “The Darkness” is that they don’t ever take themselves too seriously. The emphasis is on entertaining rather than scaring. So, with that said, I’ve made it my pre-new year resolution to see as many of these flicks as possible. Films like “Blood Sucking Freaks”, “Don’t Go In the House”, “The House on the Edge of the Park”, “Thriller, a Crude Picture”, “The Candy Snatchers”, “Isla films”.. the list is endless. And what better way to initiate this resolution than with Joel Reed’s “Blood Sucking Freaks”. This film epitomizes the above criteria- filmed in 10 days in the basement of Reed’s house with actors on loan from soap operas and various other low budget projects and using every last bit of film (i.e. certain exterior shots giving off that sputter that indicates the cameraman was using ends of film reels). Seamus O Brien plays Sardu, the ringleader of a troupe of rejects that orchestrates off-off-Broadway shows of the macabre using real life victims. His right hand man, Ralphus (played by a black midget with an afro named Luis de Jesus) is sheer delight from start to finish, whether he’s enjoying a decapitated woman’s head giving him oral pleasure or throwing pieces of chicken into the cage of naked women held hostage, de Jesus is a walking comedy, sincerely playing up the weirdness of his character. And I wonder if this is where the inspiration for the character played by Dennis Hopper in “The Texas Chainsaw Massacre 2” springs from? Black midgets with afros aside, “Blood Sucking Freaks” rolls along with little regard for consistency or logic. In one scene, while a police detective talks to a famous football player (played by Niles McMaster) about the disappearance of his girlfriend, why does the football player have his shirt off, combing his hair in front of a mirror? And why doesn’t the detective question this? Because in the world of exploitation, you learn to question nothing. “Blood Sucking freaks”, filmed in New Jersey in 1976, capsizes the mores of decency and explodes across the screen with giddy dementia. Isn’t that what exploitation is all about? Rent it now. Thanks Brad for sending me this. I know a few people out there who will appreciate the selection. You're one click away from internet radio around the globe. Dutch alternative station? It's there. Brazilian reggea? It's there. God bless the Internet. Highlight this link, save it, use it. Ricky Bobby on the racetrack? Talk about life imitating art. And I chose to post this video with it's German newsreel soundtrack just to add to the absurdity. Listen carefully for the word Kung fu!